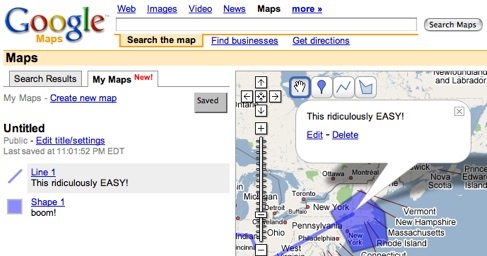 Google now lets you create online annotated maps with amazingly simple tools. You can add info windows (with html), plot lines and add polygons. It really is the easiest thing imagineable. Go there and try it. This example map has absolutely no point. I just made it on the fly to prove to myself how easy this is. Do you know how long this would have taken to do in the “old” days (earlier this year or yesterday really)? Things really are moving fast. I am so happy, it’s almost sad.